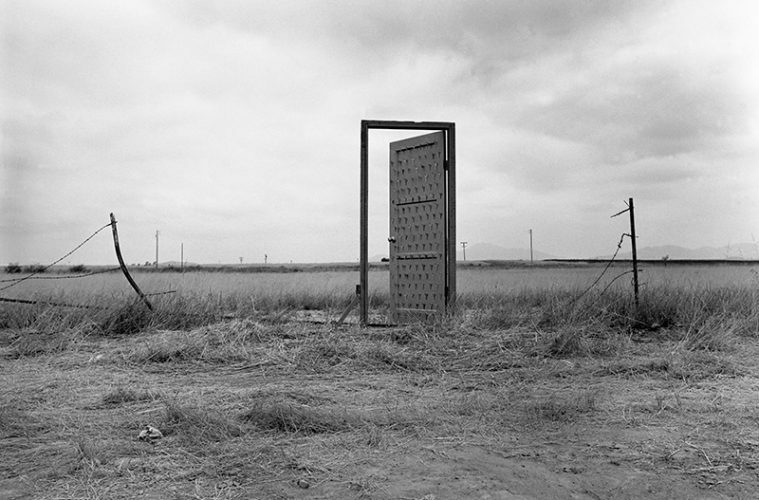 Richard Lou, Border Door, May 28, 1988. Site-specific installation/intervention performance. Gold painted wooden door, nails, keys, door knob, hinges, and blue wooden frame. Free standing workable door installed on the Mexico/U.S.A. border ¼ mile east of the Rodriguez International Airport. The performance extended to the neighborhood where the artist grew up in Tijuana, where he gave out over 250 keys inviting the residents of La Colonia Roma and Altamira to use his Border Door. Photo by James Elliott, courtesy of the artist. With exhibitions and performances at more than 20 venues across the city, Houston’s spring of Latino art is in full-swing. Developed around the Latino Art Now! (LAN!) 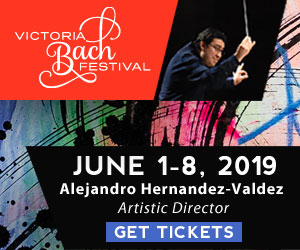 Conference at the University of Houston (April 4-6), the event has become a city-wide cultural season, the only Latino-led event of its scale in Houston’s history, boasting an impressive roster of exhibitions and events across the city. The conference was founded in 2005, and is now in its sixth iteration. Initially intended to draw critical attention to Latinx artists working outside the mainstream Latin American art world, it has also become a way to grow the field of study of Latinx art, and push for institutional support of exhibitions and artist-led programs across diverse cities. Previous LAN! conferences have been held in New York, Los Angeles, Washington, D.C., and Chicago. 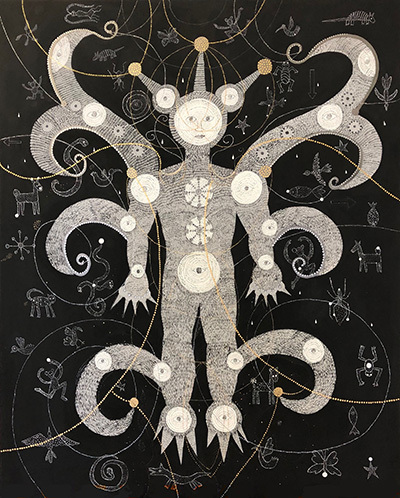 Gerardo Rosales, Cosmic Angel, constellation 1, 2018. Acrylic on canvas, 60 x 48 in. Image courtesy of the artist. Memphis-based artist Richard Lou has attended every previous conference. “The conference is a way of reaffirming ourselves as practicing culture-makers and it’s a way to come together and convivir, to share life with each other, to be with each other,” he says. Houston-based artist and organizer Moe Penders cites a recent study showing that Houston’s Latinx communities make up 45 percent of the city’s population, but have historically garnered less than one percent of the city’s arts funding. 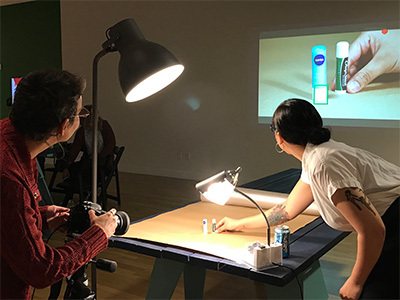 In many cities, “the Latinx artists in the city don’t get shows at [institutional spaces]… We have tons of talent, but usually it’s up to us, making our own spaces, creating our own shows in our studios, or whichever spaces we do have available.” Many of Pender’s shows have been held at the artist-run studio space El Rincón Social, for example. At one of the organizers’ first meetings, they put together a spreadsheet of artists’ names and contact information – the first time any organized directory of Latinx artists existed in the city. That spreadsheet grew so quickly, they realized there was a need for a more permanent site connecting artists. “Manteca stands for Latinx Artist Registry Directory, which is LARD, and from lard we got Manteca,” Penders says. Supported by grant funding, Manteca is a free online directory that is serving as the springboard for seven curated exhibitions this spring. Suzy Gonzalez, All She Wants for Christmas, 2011. Oil on canvas, 30 x 30 in. On view with the Gilbert Cardenas collection at University of Houston. Image courtesy of the artist. The impetus for organizing has been difficult to sustain in the past, Montoya notes. She thinks some of that difficulty lay in the absence of sustained educational focus on Latinx history and culture. “At University of Houston, for example, Latinx and Chicanx art history was never really taught in a systematic way,” she says. “Latinx students were not taught to understand their own history, were not taught how to communicate it.” This absence of historical context left many artists feeling adrift. With the arrival of LAN, she says, there is renewed energy for organizing, studying, and connecting. Collective Presence, Laura Napier’s Sea of Oil Story Share Show and Tell, Courtney Khim sharing chapstick after sharing a story on how it relates to the social culture of oil and gas. Image Courtesy of Ashley DeHoyos and DiverseWorks. At DiverseWorks, curator Ashley DeHoyos has developed a series of micro-residencies this season. Called Collective Presence, the residents (from Houston and from other cities) are thinking about collective action and decolonization, how to create space for shared conversations and political pivot points. “What could we do if we all came together?” De Hoyos asks. 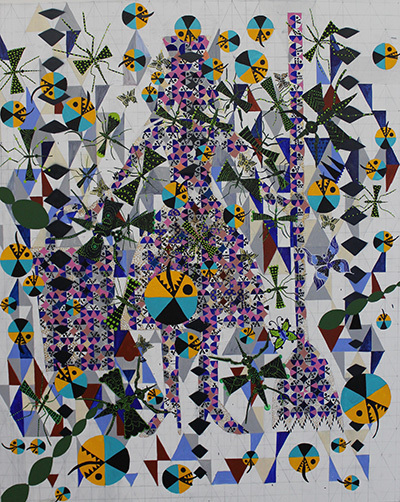 Gerardo Rosales, Pontricalisimo, 2019. Acrylic on canvas, 60 x 48 in. Laura August, PhD, is a writer and curator who works in Guatemala City and Houston. She was a CORE Critic-in-Residence at the Museum of Fine Arts, Houston, and is a recipient of The Creative Capital | Andy Warhol Foundation Arts Writers Grant for her writing in Central America. 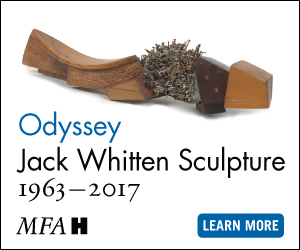 In 2018, she co-curated the Paiz Biennial and received an IDEA Fund grant for her project Mud & Blue. In 2019, she is a recipient of the Houston Arts Alliance Support for Artists and Creative Individuals Grant for a collection of interviews with Houston artists.